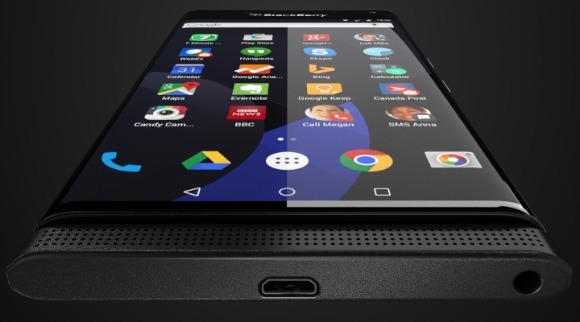 Earlier today we showed you a partial render of what looked like a supposed Android-running version of the BlackBerry Passport. At the same time, we got word that the BlackBerry device codenamed Venice would eventually be headed to AT&T. Venice has so far been rumored to come out in November with Android on board. And now a leaked render surfaces claiming to depict it in all its glory. The source is once again @evleaks, the famous sometimes retired leaker of all things mobile. He was also the one who brought us the image of the Android-running Passport a few hours ago. The Venice model pictured above is going to be a slider, with a full physical QWERTY keyboard in tow. It should sport a 5.4-inch QHD touchscreen, a 16 MP rear camera, a 5 MP selfie snapper, 3GB of RAM, and a Qualcomm Snapdragon 808 SoC with a hexa-core CPU. Good move, just don't hire Elop..